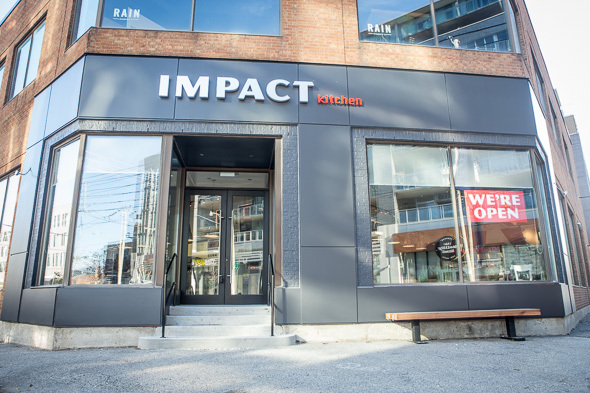 Impact Kitchen is a lofty restaurant that aims to be an all-in-one source for clean eating at breakfast, lunch and dinner while also dispelling the common belief that healthy food is bland and boring. Its logo, an upside down crown, is quite fitting. The goal here is to challenge the status quo and offer diners an everyday option that doesn't involve a deep fryer, but also isn't exclusively vegetarian. 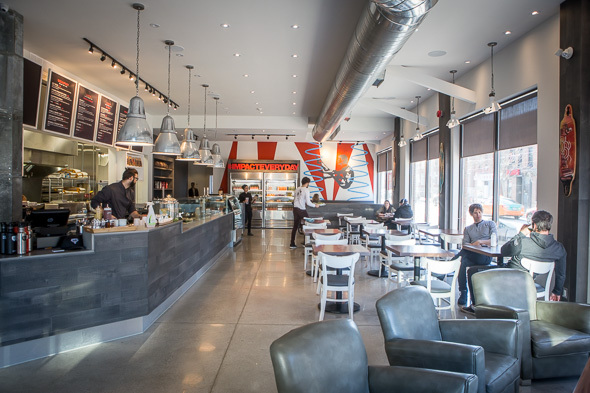 The massive 5,000 square foot restaurant, cafe and commissary feels much like a contemporary cafeteria. 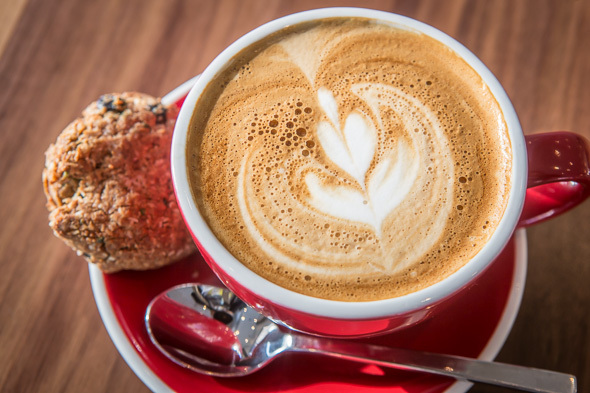 There's a mix of casual seating at tables and arm chairs surrounding two service counters: one for coffee and baked goods, the other fronting an open kitchen. Orders are placed with the cashier but servers will deliver food to your table. First time restaurateurs Josh Broun and Frank Toskan come from backgrounds in nutrition and fitness, and they've brought on chef to implement a menu that can accommodate vegan and paleo diets, but is designed mainly around a philosophy that promotes minimally processed and nutrient rich foods. 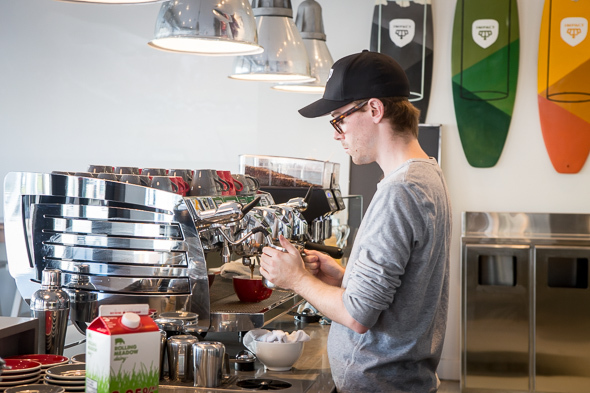 Covering all the basis of everyday eating, the coffee bar offers drip ($1.90-$2.62) in addition to pulling espresso based drinks from a private label roast from De Mello Palheta Coffee Roasters. 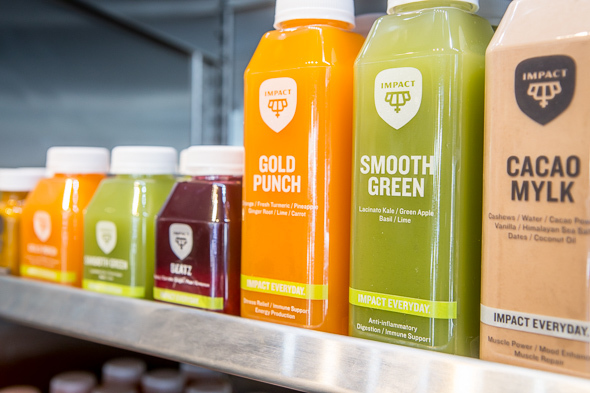 Almond milk (+$0.50) is on offer too, and these are made in-house, as is the line of cold pressed juice. The whole kitchen is gluten-free (so cross contamination need not be a concern) but it is likely most noticeable in the selection of baked goods, which are also raw and vegan. 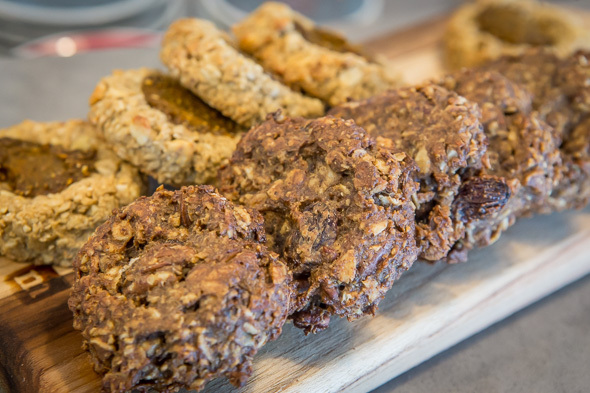 The chocolate chip cookie, for instance, comprises cashew flour, coconut sugar, dairy free chocolate chips, maple syrup and oat flour. It's dehydrated over 24 hours (rather than baked) which actually gives it a crumbly, very cookie-like texture. At breakfast find the usual suspects of healthy a.m. options like oatmeal ($5.95), and chia ($5.95), plus savoury, protein packed selections like the power breakfast ($9.95) featuring spinach, scrambled eggs, salsa, sweet potato and avocado. 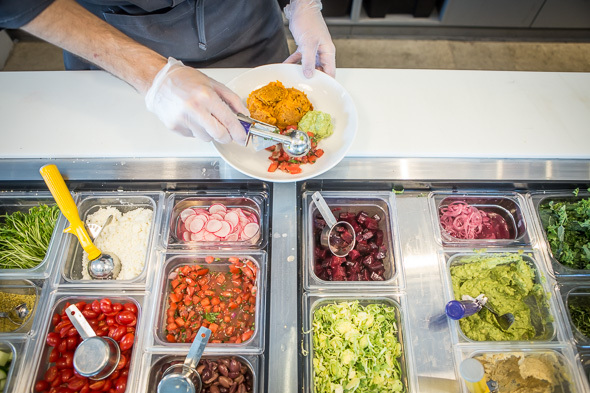 From 11:30 a.m. on, the kitchen concentrates on salads and power bowls while options like the zesty Mexican ($14.95), kale caesar ($12.95) and Asian slaw ($14.95) are among the selections at dinner. Broun explains to me that they're "not into counting calories, but rather making calories count" and this is evident in the dish I try, the Hero power bowl ($12.95) with added chicken (+$4). 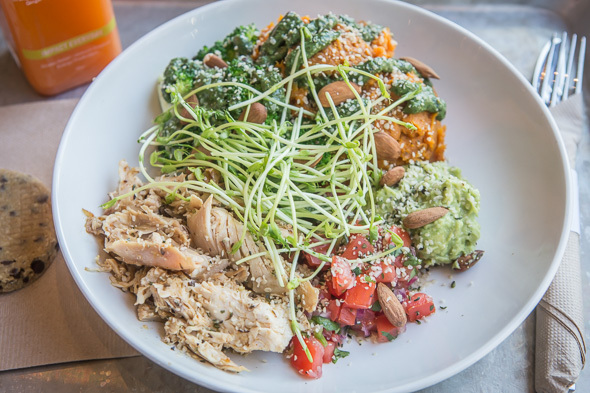 Every component on this plate serves a purpose; from the easily-digestible roasted sweet potatoes to the lean and protein-rich four ounce portion of shredded roast chicken. Nuts and avocado contribute healthy fats, while sprouts and a garlicky salsa fresca add some brightness. I feel full halfway through eating, but what is most surprising is that hours later, long after I've left, I'm still feeling full. It's not the most exciting cuisine in the city, but I didn't find the food bland either - it's a welcome change at the tail-end of 2015, a year where fried chicken ruled on menus everywhere. It's not that I have anything against fried chicken, but I can't eat that every day. This I could.